Snippets of Jack: "Send Him Back Myself"
In the opening scene of The Pirates of the Caribbean: At Worlds End, (if you don't count the weird two minute scene where you basically watch a bunch of sad people sing and get executed), Barbossa, Elizabeth, Will, and the rest of the crew arrive in Singapore too gain help in rescuing Jack from Davy Jones' locker. Elizabeth and Barbossa enter in a little row boat while she sings a little song. (If they are trying to make a quite entrance, I don't really understand why they would come in singing). Will has gone in ahead of them in order to steal the charts needed to navigate them to the locker. The other crew members sneak in and prepare to give Elizabeth and Barbossa weapons if necessary, which is pretty good because their other weapons we're confiscated before they could meet with the pirate lord of the South China Sea, Sao Feng Elizabeth and Barbossa ask Sao Feng if he could provide them a ship and crew for their voyage to Davy Jone's Locker. The problem is, Will has already been caught by Sao Feng's men when he was sneaking in to get the maps. They pull out will from a barrel of water and question them about him. How did they keep a man alive in a barrel of water? Elizabeth and Barbossa of course have to pretend like they don't know Will because they don't won't Sao Feng to know that they were part of the break in. Sao Feng then threatens to kill Will, and Elizabeth (and Barbossa sort of) gasp, giving it away. Sao Feng gets super mad and starts ranting to them about how he will not be taken advantage of. Elizabeth and Barbossa then have to explain why they need the charts in the first place: they need to bring back Jack so that the nine pirate lords (including Sao Feng) can meet at Shipwreck Cove to discuss what will happen now that Lord Beckett has the heart of Davy Jones. Sao Feng does not react well to this idea. 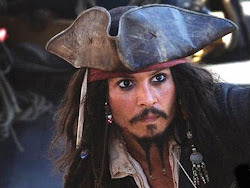 "The only reason I would want Jack Sparrow returned from the Land of the Dead is so I could send him back myself!" Elizabeth then feels the need to give him a pep talk and smack him back in place (as she does a lot in this movie). "You are Sao Feng, the Pirate Lord of Singapore! You command in an Age of Piracy where bold captains sail free waters. Where waves aren't measured in feet, but as increments of fear, and those who pass the test become legend." Sao Feng then realizes that one of the other men in his presence has a fake dragon tattoo, giving away that he's not really part of his men. Sao Feng assumes that he's part of Barbossa's crew. Sao Feng: "Drop the weapons or I'll kill the man." Barbossa: "Well kill him. He's not our man." Will: "If he's not with us, and he's not with you, then who's he with?" Thanks for stating the obvious Mr. Turner. That's when everyone realizes that the British navy is also spying on them. Singapore really is the place to be. And when you have a bunch of pirates and soldiers in one place with a bunch of guns, you know what will happen: a full out battle. Lucky for Elizabeth and Barbossa, Gibbs and the other crew men succeeded in their break in and were able to throw them their weapons from beneath. Will is freed and they start blowing up things and fighting people throughout the city. They do manage, however, to get a crew thanks to Will and run off with the charts. Will even makes some kind of agreement to meet Sao Feng somewhere once they have gotten Jack. It ends up being a pretty successful journey to the opposite side of the world. Elizabeth was pretty worried about the trip at first. Elizabeth: "Is the that terrifying?" Barbossa: "He's much like meself, but absent my merciful and sense of fair play." Because that's pretty much exactly what Hector Barbossa is like. Got to hate it when a fake tattoo ruins the surprise!